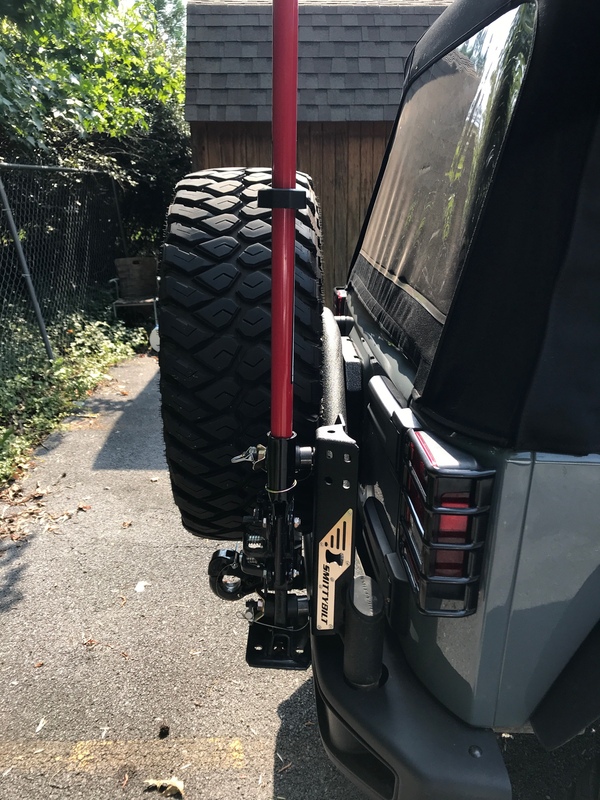 Looking for some real world use feedback on this Smittybilt tire carrier. I just recently found it that it is compatible with the factory 10A / Hardrock bumpers which makes it very appealing to me. I’ve had that carrier on my hard rock bumper for half a year now and can tell you all you want to know about it. I looked at what few options are out there for carriers that fit the bumper and decided to go with this because it bolts directly to the frame and I can actually get the use out of that hole in the bumper. First off, I’ll tell you that the old reviews online about the carrier having issues are outdated. Smittybilt redesigned the carrier correcting its weaknesses. Now you will get the updated model from wherever you order from. The new design uses a cotter pin through the bottom bolt and has a castle but. This prevents the carrier from loosening up over time and rattling. In 6 months, I haven’t heard one single noise out of my carrier. Not even when bouncing around off road (and I have my hi-lift bolted to it as well). The only down side I have found to this carrier is that it does make the rear tailgate a bit more stiff to open and close, but it’s really not a big issue. And if you get the pivot greased well then it moves better. The finish is perfect and I welds are all solid. I will warn you that the install will take far longer than you expect. You have to remove the whole bumper to install, the instructions are a bit vague and leave you to yourself to fill in some of the blanks. I’ve been building cars extensively for 15 years and it took me awhile to decipher and figure out what they meant. I ended up having to grind down one of the nuts that they provide to bolt to the frame because it’s welded to a large plate and stick to fish it inside the frame. (The plate was too large to get inside the frame and into position) but a small bit of shaving and it fit perfect. This also reminds me that you will have to remove your passenger side tow hook to bolt on the carriers assembly. I saw one person that engineered a new way to attach it back on but I haven’t worked on that yet. 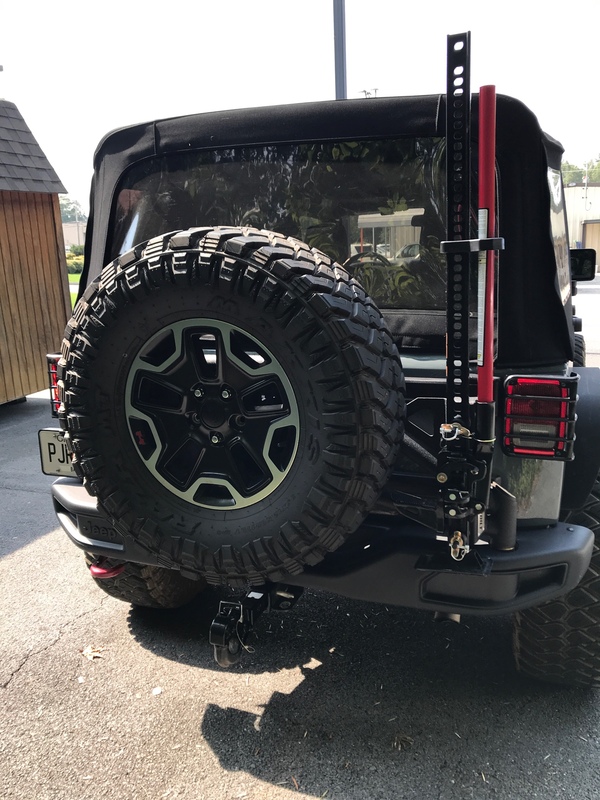 Next: the adjustability of the tire carrier for different size wheels and tires is very good, but I have fat 35” tires on stock rubicon wheels and it had too much backspacing to bolt on without a spacer so I had to order a wheel spacer to be able to get it to reach. (I ended up using a TeraFlex tire carrier spacer). As far as the rotopax mount: if you plan to run rotopax on the supplied mount, it has to be a 1.75 gal rotopax can to fit. 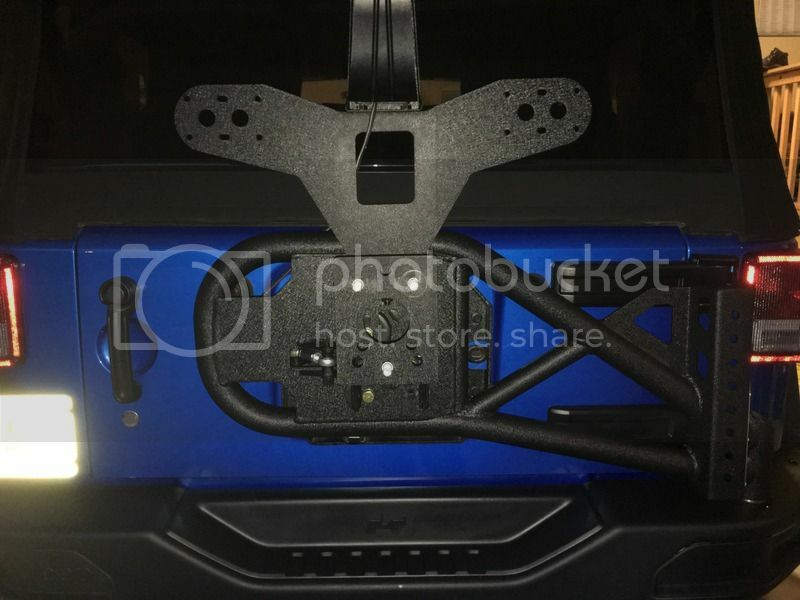 And if you don’t use the rotopax cans, you can assemble the tire carrier without that mount and it won’t be in the way. Adjustments. When you torque down the pivot point of the carrier, you need to torque it down until the castle but cannot tighten any further, THEN back it up one notch to where the cotter pin can be inserted. This will load the assembly so it won’t rattle, but not so much that it is stressed to move and difficult to open. Then move to the adjuster on the tailgate. You adjust this by opening the door 2” from closed, insert your wrench and tighten the adjuster until the carrier assembly seats against its rubber bushing that is mounted against the door. Lock it into place and when you shut the door, it pushes the assembly slightly into that bushing and keeps pressure on it so it doesn’t ever rattle. THATS IT! it’s honestly a great unit and I recommend it! I’ve loved it. The beer bottle opener is actually useful when camping beside the jeep. I keep my hi-lift mounted to the carrier so it’s quickly accessible when I’m off road and mounted and dismounted it plenty. I still plan to mount a cb antennae to the mount as well soon. ssinga, 2qik2see, MW2016 and 3 others like this. Thanks for your detailed review...I have also been looking at this carrier for my Hard Rock bumper. Awesome write-up. I really appreciate the info. Will be mounting a stock Hardrock wheel with 315/70-17 STT Pro to it so I hope it fits. Ssinga, it will fit for sure. If it ends up having too much backspacing, you’ll just add a spacer and then adjust for exact fit on the carrier. That’s what I had to do. I just ordered this setup for my Hard Rock bumper, I hope it goes smooth.... I ended up ordering it in the "light texture" finish hoping it will match the bumper fairly close. I also ordered the additional hardware package for the 10A/Hard Rock bumper. ssinga and 15Hard-Rock like this. I finished up my Smittybilt carrier and I have to say it's a nice setup minus the installation instructions which are terrible.... The carrier itself is solid, no noises at all and it swings open nicely. The new light texture finish matches the hard rock bumper really good. You will need to order the "76858HDW" kit for the reinforcing in the frame. I was also able to mount the passenger rear tow hook fairly easy. If you take your time, this is a very nice carrier for the money. I do believe smittybilt has made numerous revisions to it within the last several years. ssinga, 2qik2see, 15Hard-Rock and 1 others like this. ssinga, HyeClmr, 15Hard-Rock and 1 others like this. HarpersJK, I also have the Smittybuilt tire carrier mounted to my 10A/Hard Rock bumper on my Recon. I am not aware of the Frame reinforcing kit and was not able to mount my RR tow hook back under the bumper after mounting spare tire mount. I searched for the part number you listed and came up with nothing found at both Q-Tec and 4Wheel Parts where I bought the mount. 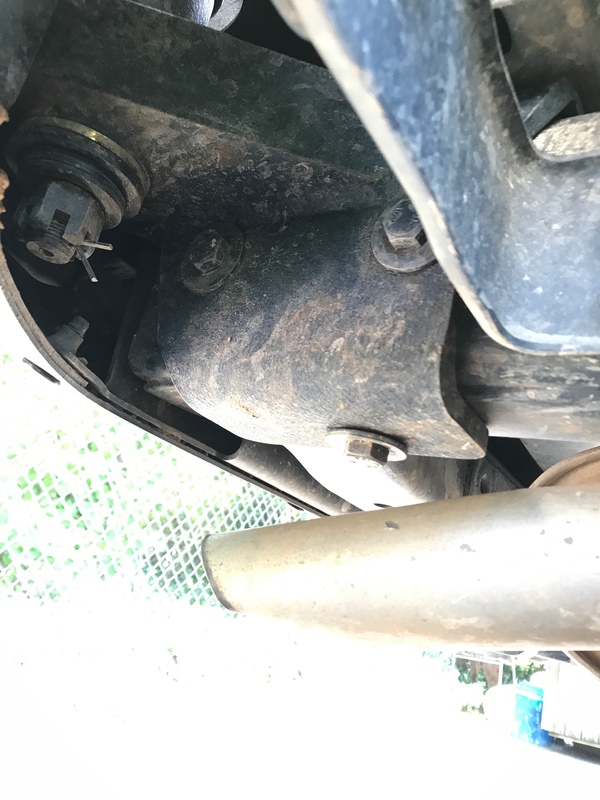 Could you let us know where that part number will turn up some results and is that reinforcing kit mandatory for placing the tow hook back in it's original place? I would sure like to have both tow hooks in place, just in case I TWO HUMMERS that need help at the same time. Thanks for all the info. Jeeps are BUILT, not bought!! Great info. I have 2 sitting in the garage waiting to be installed. I got the hardware kit from Autoplicity, part number 76858HDW. They currently have 28 in stock and are $35.99, you will only need the frame reinforcing piece. I did end up using some of the fasteners in that kit. As for the passenger tow hook, I didn't modify the hook at all. I used the top hole and drilled a new hole up from the bottom side through all (3) pieces of steel...... It wasn't fun, but it worked. Not sure anyone else has done this yet with this carrier, but I modified the brake light bracket to work as a rear light mount. Turned out really good, I can take better pictures of the actual bracket itself if anybody is interested. ssinga, 2qik2see, HyeClmr and 1 others like this. Great idea. Did you use an alternate 3rd brake light? Yes, I used the Poison Spyder 3rd brake light and license plate combo. I've had lots of inquires on my modified brake light bracket so I've attached a few pics of how I made it up. The only piece I had to make from scratch was the light bracket itself, which was made from some 1/8" aluminum. The rest I modified as needed from the brake light brackets. If you have any questions, please let me know. ssinga, 2qik2see and 15Hard-Rock like this. Finally got around to installing my Rotopax cans and Hi-Lift jack. ssinga, 2qik2see and proper13 like this. Finally got one installed yesterday on my son’s Hard Rock. Had to add 1” of spacers for the fire mount due to having the stock wheel (extra Metalcloak front bumpstop came in handy for this) and still need to add about 4” of length to the brake light harness. 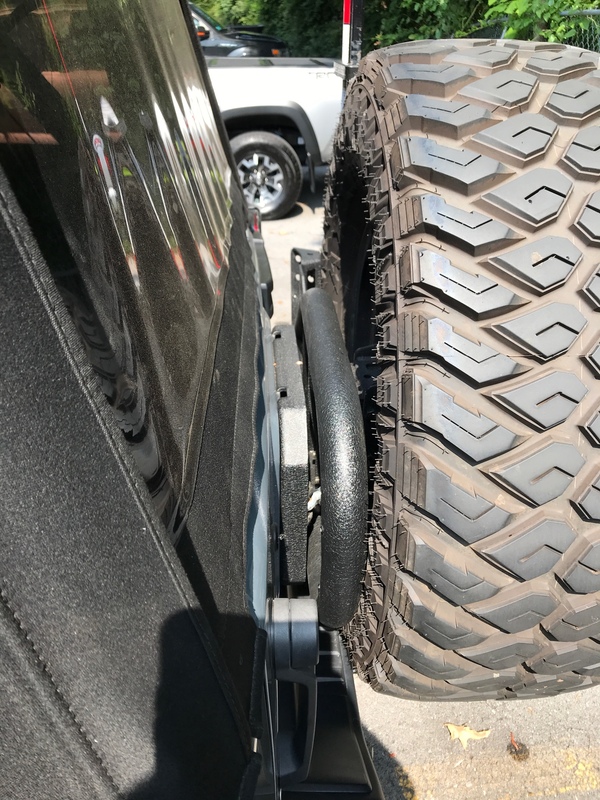 I talked to a Smittybilt tech ahead of time to find out about the hardware kit that I needed for my Recon. I gave the Quadratec phone rep the part number and they already knew I'd need that too, so I guess it pays to come late to the party sometimes. I have strong regrets about the RR tow hook. I completely forgot about it until I was don and was not willing to pull the bumper back off to reinstall it. Now that's all I notice when I look at my Jeep from the rear. harpersJK, 2qik2see and j2wu like this. Nice set up. Any rattles? Thanks for the kind words. Honestly, I got so many rattles I don't even know if it's the tire carrier or soft top or the Slipstream enclosure lid or what. I just learned to ignore it. I definitely hear it rattle when I close the tailgate, but it doesn't sound like the rattles I hear when I hit a bump. I recently added some Rotopax and had to take off the slant mount. The Rotopax mount for the slanted one goes underneath and there wasn't room for the Rotopax because of the bumper being too big. Here's what she looks like now after losing a couple of fenders at Windrock Park in Oliver Springs, TN. Any way you can post on how your roto pax are mounted. I haven't ordered any yet so maybe thats why i can't figure it out but the instructions don't talk about it and was wondering how its done. First I don't have this mounted to the 10Abumper. i have it mounted to the XRC gen 2 rear bumper, and second looks like i got the older model. I hate it. if you are buying this make sure you get the one with the castle nut. mine is the older version and it rattles like crazy. You can find these things all over craigslist cheap so make sure you are not buying the older model. Please see the attached pic of how I setup the Rotopaxs. if you need any other pics, please let me know. Sorry to hear you may have gotten an early version of the carrier. I bought mine from Northridge and it's been dead silent for over a year and very solid. Hey thanks. I posted this awhile ago and have since purchased 2 new ones. I have one mounted on my sons Hardrock with the 10A bumper. Works perfectly. No rattles or noises to speak of. The one I got for mine is still in the box as I recently picked up an AEV bumper and plan to see it I can get it to work with it.